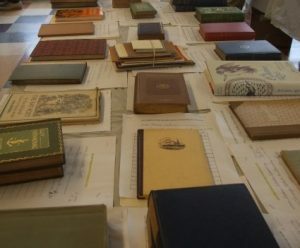 While sorting through your donated books, we set aside and research unusual or older volumes, autographs, and more. A System of Natural Philosophy J. L. Comstock, M.D. (New York) 1830 original binding (leather? ), very fragile, some torn pages, period writing on endpapers. Goetheana: A Centenary Portfolio of Forty-Three Facsimiles & Reproductions of Unique or Rare Items from the William A. Speck Collection of Goetheana in Yale University Library Yale University Library: New Haven, CT. 1932 Number 7. 500 copies. In part of original box. A Christmas Carol Charles Dickens. Paul Elder and Company (San Francisco) ~1905 Impression Classics from Tomoyé Press. Leather cover, gilt-edges, tree bark incorporated into end papers. SOLD Barnett Newman: A Catalogue Raisonné Richard Schiff. SOLD African Art Michel Leiris and Jacqueline Delange. Translated by Michael Ross Golden Press (New York) 1968 11th volume of 'The Arts of Mankind' series edited by André Malraux and André Parrot. Albert Beuret, series editor. SOLD The Works of Horace, Translated Literally into English Prose C. Smart. Revised by M. Campbell. Nichols & Co. (New York) 1800 fragile. Volume 2 of a 2-volume set. SOLD Once Upon an Island: Stephen Scott Young in the Bahamas William H. Gerdts. Adelson Galleries (New York) 2012 Oversized: 11" x 13"
SOLD A Collection of Old Ballads: Corrected from the best and most Ancient Copies Extant. 1723 modern binding. Illustrated with copper plates. SOLD Mother Goose Chimes McLoughlin Brothers (New York) 1898 oversized, with linen pages. SOLD ...I Never Saw Another Butterfly... Children's Drawings and Poems from Theresienstadt Concentration Camp 1942-1944 Hana Volavkova, editor. McGraw-Hill Book Company: New York. printed in Czechoslovakia. Has original dust cover. SOLD Versailles: The History of the Gardens and Their Sculptures Stéphane Pincas. photographs by Maryvonne Rocher-Gilotte. Thames and Hudson: New York. 1996 New.